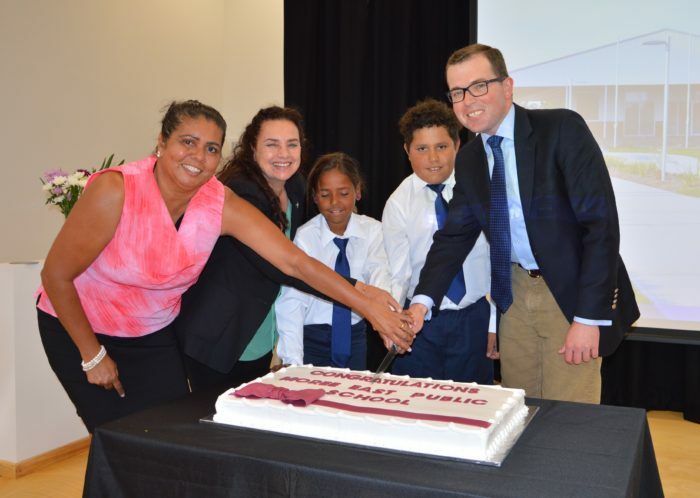 Cutting the opening cake – MoreeEast Public School Executive Principal Muriel Kelly, left, NSW Public Schools Executive Director Michelle Hall, Moree East Public School captians Shelby Briggs and Cody Picker and Northern Tablelands MP Adam Marshall at the opening today. MEMBER for Northern Tablelands and Parliamentary Secretary for Northern NSW Adam Marshall today visited Moree East Public School to officially open the new $16.3 million school upgrade. Mr Marshall was joined at the ceremony by members of the school community and Moree Plains Shire Mayor Katrina Humphries. “Students, staff and the Moree community should be proud of their new future-focussed learning spaces,” Mr Marshall said. “Education will shape the future for the young people of Moree and we are committed to creating better life opportunities for future generations. “These wonderful new facilities will create a modern learning environment that will continue to benefit students and the Moree community for many years to come. Mr Marshall praised Education Minister Adrian Piccoli’s commitment to improving the learning environment and student results for Moree East Public School students. “This magnificent upgrade of Moree East Public School was part of Mr Piccoli’s promise to invest substantially in bringing Connected Communities schools up to the standards we expect of our schools anywhere in the state,” Mr Marshall said. “The NSW Government is putting schools at the heart of the communities in a concerted effort to raise the educational outcomes and life opportunities for Aboriginal students. “With these new facilities and dramatic positive change of culture at the school, I’m looking forward to seeing this trend continue and local students getting the very best education in what is the most advanced school in the state,” he said.